The indie games were the big draw for me at SXSW Gaming Expo. I didn’t have costume to enter to the costume contest, and I couldn’t figure out exactly what time we were supposed to watch the Smash tournaments, so I spent most of my time trying out a variety of indie games. The first game we looked at was Super Sky Arena. 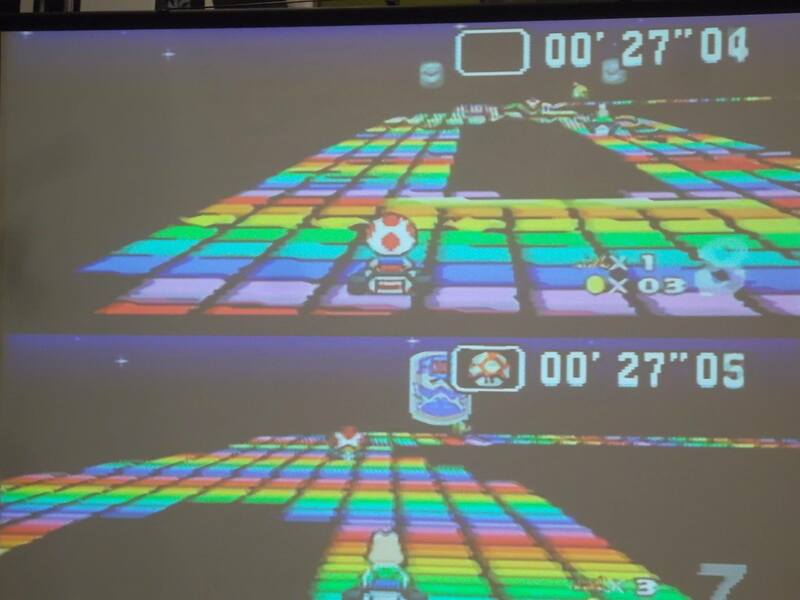 The game is star fox multiplayer with a lot more color. Moving around and shooting was familiar enough but what was difficult to get used to was using the right stick for boosting and braking. It doesn’t act like the c-buttons in Star Fox because Star Fox makes you constantly moving even while braking, but this game lets you hold still for however long you’d like. One of my kills came from just standing in spot shooting at 2 ships who were fighting near by. I enjoyed it, just like I enjoyed Star Fox before it, and then it was over and I had to move on. I did win the match, which was nice. Next we walked by a game that looked a bit like a pixel version of Smash, which turned out to be just that. Rivals of Aether has you fight as one of several furry animals in an attempt to, like in smash bros, knock your opponent off the stage. I picked Absa, who is a lighting goat, and I fought in a 4 player free for all in which I emerged victorious. I received an Absa button as a reward, which is probably my favorite souvenir from the expo. The game is fun, fast paced action that managed to secure my vote for multi-player game. Othello with lasers. That’s how I kept hearing the game described by passer-by’s. It’s an apt description. You play on a black and white grid and try to shoot your opponent. And like in Splatoon, you can only move on your own color. Matches are very short. We played 2v2 but observed a few 1v1 matches. It’s a simple design but it works well, and given the option, I’d play it again. Soft Colors and interesting character got my attention but it’s the humor and style that got me hooked. Read Only Memories is probably my favorite game of the Expo and my vote for best single player game. It’s an odd looking cyberpunk game. Not what you’d expect from a booth that had Neuromancer sitting on their table. The game looks friendly, but I think that works to it’s advantage. It’s a point and click style adventure, that I played just enough to know that I wanted to play more. I grabbed a poster and a card added it to my wishlist then moved to the next game. I don’t even know how to describe Soft Body. It’s a sort of surreal puzzle game with hypnotic music and when I sat down to play it, it was almost like there was no Expo happening behind me. It’s relaxing, and while it did seem like there was a bit of challenge to be had if I kept playing, it was still definitely a calm game. And I would have liked it for that alone. Kingdom caught my eye early on but every time I passed by it, there was someone playing. I never got to play it, but I did get to see people riding a horse along the most serene looking vistas. One of the booth runners saw me and asked, “Would you like to run a kingdom?”. Um.. Yes. Unfortunately, I never got to try, but I am still very interested. The expo did it’s job. I got to play games I may not have discovered otherwise, and with most of them, my short time was not enough. It was cold and rainy. I was about to compete in a game I had scarcely played in 20 years. 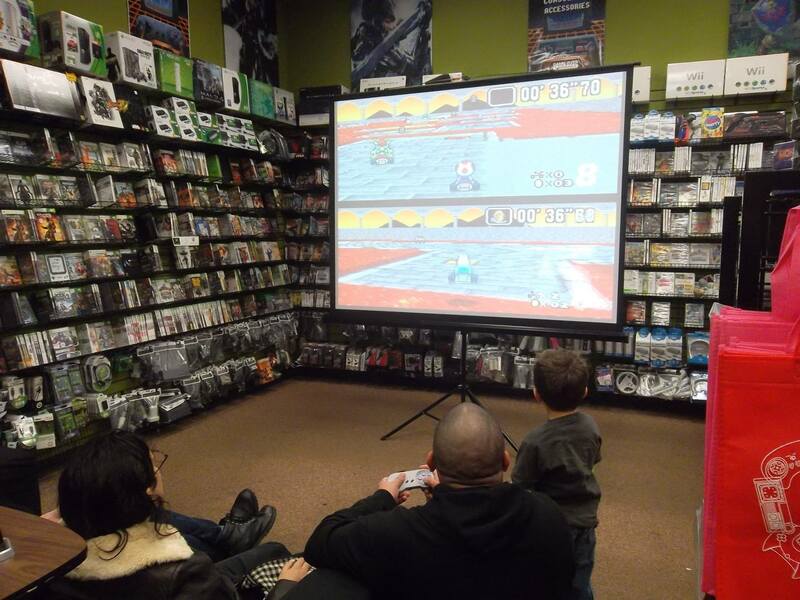 There was hot chocolate and cookies being served as people warmed up for the Super Mario Kart tournament. It was a small but enthusiastic field of racers; I lost all my confidence the moment we stepped foot in the Game Over video game store. Myself, my brother and my nephew during the practice rounds. Then we raced. I did well the first round, which was VS races. The second round was Battle mode, in which I had to eliminate my cousin to move on. The final round was a GP race. I lost, finishing second. I still got a prize, and overall it was a satisfying tournament. I look forward to next time. Me losing to first place. I thought it was fun seeing the summary they give me of the year. Here it is if you want to see. Just yesterday I went to Game Over to see if they had any good co-op games to play. 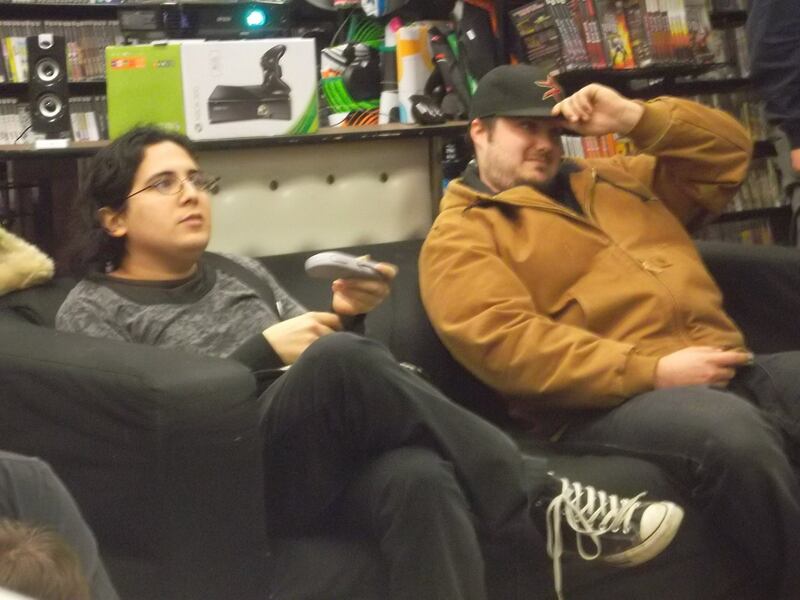 While browsing a guy asked if my cousin and I wanted to join a Goldeneye Tournament. On a whim, I did and I took first. The person in the photo with me took second. I’m not sure who they are, I didn’t get a name but they were coo. I also didn’t expect a prize when I entered, but I got one: A gift card (shown above.) With my giftcard I bought Shadowrun (SNES) and a Birdo Plush. Birdo is the first trans character in video games which why I bought the plush. It’s also quite soft. Things aren’t as desperate as they were last time I posted but not incredibly better so I could still use any commissions I can get, either art or writing. If anyone wants to hire me just email or Skype me. After months of owning it, I finally got a chance to sit down and relax with some Shadowrun Returns. I finished it today and I have to say I am not at all disappointed. Playing a Decker actually wasn’t as fun as I thought it would be. There was only one moment in the game that I enjoyed doing a matrix run and it was partly because I had a team in a fire fight behind my deckers with my men protecting us while we hacked. The story was pretty enjoyable and reminded me a lot of the Genesis Shadowrun (kinda). Character customization was at about what you’d want as far as stats but if you don’t build a character for combat, then boss battles get a little rough. I decided to ultimately focus on Body, Quickness, Intelligence and Charisma as my stats. And Pistols and decking being my primary skills. I like the talking options that extra charisma gets you, so I usually max that out in games that have it or something like it as an option. I would definitely recommend Shadowrun Returns for any fans of Shadowrun and anyone looking for a fun turn-based strategy RPG type game. If anyone is still following my blog, I just want to say Merry Christmas, Happy Yule, and Happy New year. My semester ended and I’ve just been enjoying some time off. The end of the semester was pretty rough but I managed an A in Art and a C in ASL which is good enough to let me get into my final set of classes. Which means, other than some financial problems, I am all set to graduate in the Spring. During my break I’ve just been relaxing and playing games. Been in a Mega Man mood lately. Mega Man X and 3 are the games I’ve been playing from that series. I tried out some of Wii Sports Club and it’s pretty fun, just like Wii Sports was. Also thinking about Castlevania lately. Last time I had a vacation I beat Rondo of Blood for the first time. Wishing I could do something like that again. With all the attention Catherine had gotten when it first released, I found myself really wanting to play it. I heard several people talking about how good it was. I was pretty excited. I knew a game by Atlus would let me down in some ways but I didn’t know I’d find all of these problems. The game’s two love interests, Katherine and Catherine, as characters, really lack any sort of depth. This is possibly due, in part, to the fact that the characters aren’t really given many scenes or much variety in the scenes they are in. Katherine and Catherine come off as archetypes. There is the nagging girlfriend (K). Then there is a flirty/crazy one (C). Because those seem to be C’s two modes, she’s flirty and naked or she’s crazy and threatening Vincent. These personality traits even carry over to their text messages—there is the sound of K sighing when Vincent reads her text messages while C’s texts are all giggly. That’s all there is to these characters. As my roommate said, they are two dimensional characters. To add to their poor portrayal, Vincent always seems to be written as the victim being overwhelmed by these two forces. 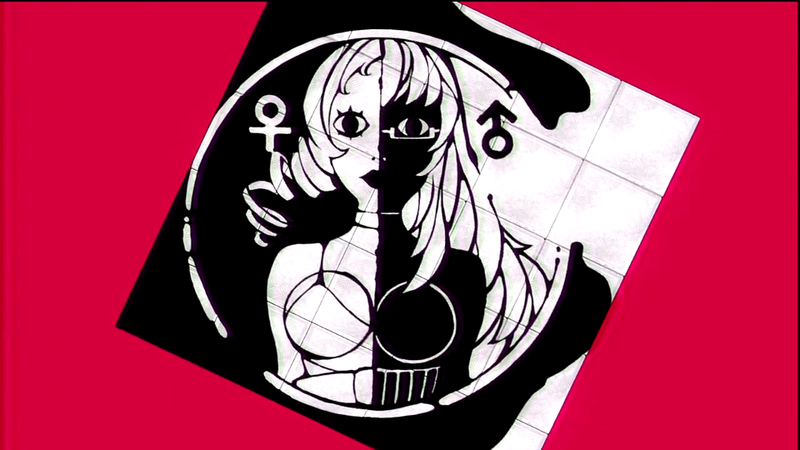 The women, then, are shown as antagonists, to the point where they are literally a few of the bosses. Then in most endings, he is never punished for all of his poor choices. Everyone decides to ignore the fact that he actively lied to his girlfriend, and actually did cheat because the succubus was, in fact, a real person, even if they couldn’t see her. Then there’s Erica, the most disappointingly handled character in the game. Even from her first interaction with the main cast you can see questionable choices. Similar in theme to Persona 3’s trans woman, Erica’s introduction as an important character is her flirting with the boys and referencing kink. In the scene, Toby is complaining about never getting girls, saying that he wants an older woman and mentions adult fun. Right on cue, Erica shows up saying, “Hmmm? So, did I hear someone call for me?” followed shortly by, “I’ve got a nice pair of stiletto heels I know how to use.” Because, of course, a trans woman in an Atlus game will immediately flirt with the inexperienced, eager, young man. Throughout the game every major male character says things that are transphobic. First, when Toby starts to develop a crush on Erica, everyone starts to tell him he can’t date her. Before he asks her out, everyone at the table wonders aloud whether they should “tell” Toby. This, of course, hints at the fact that Erica is trans, and that the characters are thinking about outing her. In another scene, Toby declares, “Got rid of my V-Card, Boom!” and Orlando looks shocked and concernedly asks him, “with who?” Then Orlando looks clearly bothered by learning that Toby had slept with Erica. Immediately after that, Toby says there was “something weird about it,” after which Orlando quickly and nervously changes the subject. Later in the game it’s discovered that Erica started having nightmares, too. Toby says, “I thought only men had that dream… So maybe gender doesn’t matter, huh?” to which Orlando replies, “W-Well, I’m not so sure…” suggesting that Erica isn’t a woman. Near it’s end, the game explicitly states that only men are the ones to have the nightmares with such lines as, “I have these hesitant gentleman climb that…” and other similar lines, but Erica still had the dreams, even though she is a woman, which tells the player that the writers thought of Erica as a man and therefore think of all trans women as men. As if all of that wasn’t bad enough, in one of the game’s endings it is revealed that Erica is trans in possibly the worst way. During the game’s ending, Toby is upset because he’s never “gonna win big”, to which Erica teasingly hugs him, saying they’ll always have each other. Then Toby complains that “The other guys knew [Erica] as ‘Eric’ back in school” and that he wants his “damned V-Card back…!” To this, Erica just smiles, winks and says a wordy version of “Nope.” Then the cut-scene shows another character video-taping the interaction and enjoying Toby’s misery. This scene continues the transphobia, because Toby seems really concerned that “The other guys knew,” showing that he feels ashamed/embarrassed by having slept with a trans woman. By recording and enjoying his misery, the other character is confirming that, yes, sleeping with a trans woman is something to be ashamed of. Furthermore, Erica’s taunting and gleeful manner, coupled with her eagerness to flirt with Toby at her first opportunity, paints the horrible cliché of trans women as deceivers trying to lure men into bed. And with that, Erica is one of the worst portrayed trans characters there is. So, despite all the flaws in the female characters, how is the game? Well, you spend most of the game playing uninteresting puzzles, in which you have to push around blocks in order to climb a big tower of blocks, most of which aren’t hard by themselves, but then you get to frustratingly cheap boss levels where the boss is set too close behind you and you get killed a few too many times. To make this worse, the dying screen is fairly long and annoying to watch every time and some of the boss’s make noises that are abrasive to listen to. I actually had to mute the game on two portions because the noises coming from the boss were much too irritating. The other portions of actual game-play include walking around a bar, talking to people, answering text messages and drinking. This part could almost be called fun if it weren’t for the fact that, as you heard before, the characters are badly written. You won’t have to look too hard to find a sour NPC sitting in the bar, uttering something misogynistic. Furthermore, the text message choices were not very good. Each time I found myself thinking, “OK, which is the least bad of these choices?” Despite that, this actually was the best part in the game. A game that was so bad, I actually looked forward to these segments, if for no other reason than that I could see more of Erica, who, despite her poor portrayal, is still my favorite character in this game. That anticipation, however, started to wane as the game continually made transphobic comments. But surely a game with so much hype has a great story. Nope. Unfortunately I found that the story is at best silly and at worst really kinda stupid. Vincent, for one thing, makes unbelievably poor choices and he’s a pretty terrible person. It makes me feel like all I could do was try to salvage what I could of his pathetic existence so he could continue to be a bad person. To make this task worse than it had to be, none of my choices felt like they impacted anything major in the game’s events, and all the choices I made weren’t actual interactions between characters. I had to answer some of the worst questions they could have possibly thought up like “Are all men stupid?” After playing this game for a few hours, I found myself picking “yes”, because if these male characters I encountered represent men, then yeah, they are. As I told my friend, the story shouldn’t have lasted more than 20 minutes: Vincent would accidentally cheat, I should have been able to make him break it off with the crazy succubus girl and confess to his loving girlfriend, Katherine, and then she’d break up with him and he’d die alone. But the game didn’t give me any satisfying choices; instead, I had to choose who Vincent ended up with by answering questions that seemed random, and sometimes unclear as to which way they’d cause the in-game morality meter to sway. I don’t even want to bring up the sociological inaccuracy that is the premise of the main plot twist, if for no other reason to prevent me from spoiling the horribly stupid surprise that you will encounter if you are unlucky enough to decide to play this game. Then at the very end, in the most condescending way, Catherine (the game not the girl) explains all the themes and metaphors in the game through a chesty girl with an afro.